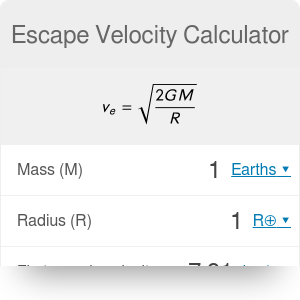 The escape velocity calculator is a tool that you can use to find what speed an object needs to gain in order to leave the surface of any celestial body, opposing its gravity. This article will explain in detail how to calculate escape velocity and the first cosmic velocity. It will also provide you with a throughout explanation of the escape velocity equation. M is the mass of the planet, R is its radius, and G is the gravitational constant. It is equal to G = 6.674 * 10^(-11) N * m^2 / kg^2. m is the mass of the starting object, and v is the escape velocity. Check our kinetic energy and potential energy calculators for more details on the topic of energy. Just follow these steps and you will have it calculated in no time! Determine the mass of the planet. For example, the mass of Earth is equal to 5.9723 * 10^24 kg. Determine the radius of the planet. For instance, the radius of Earth is 6378 km. Substitute these values in the escape velocity equation v = (2* M * G / R)^0.5. Calculate the result. It the case of Earth, the escape velocity is equal to 11.2 km/s. You probably noticed that this calculator gives you an additional value - the first cosmic velocity. What is it and what is the difference between this value and the escape velocity? You already know what is the second cosmic velocity, also known as the escape velocity - the speed required to leave the surface of a planet for good. For instance, this is the velocity of space rockets. You can find the escape velocities of all planets of the Solar System (and of the Moon) below. Make sure to check out our velocity calculator! Escape Velocity Calculator can be embedded on your website to enrich the content you wrote and make it easier for your visitors to understand your message.